Currently, banks can decide their own benchmark lending rate, the MCLR. What if your loan was linked to a benchmark set by a third-party? Will you get a better deal? India has floating home loans that become expensive as soon as the interest rates go up, but don’t float down when the rates fall. This happens because the banking regulator allows banks to peg their home loan rates to a benchmark that the banks themselves control—allowing them to benefit when they choose to, at the cost of you, the retail borrower. But it looks as if competition is finally arriving in this segment with a new home loan product from Citibank India, which uses a third-party benchmark. Here, we examine if such a thing is good for you or not. But first, some background. Several times, the Reserve Bank of India (RBI) in its monetary policy review has flagged the issue of rate cut benefits not being passed on to retail customers. It has tried thrice to rationalize the benchmark lending rate linked to home loans, in a way that there is transparency and the benefits are passed on to consumers. In the last 7 years, we have also seen home loans move through three benchmark rates—from benchmark prime lending rate (BPLR) to base rate in 2010 and then to marginal cost of funds based lending rate(MCLR) in 2016. However, none of these attempts seem to have worked and the desired goal of transparency in loan rates has still not been delivered. Last year, during a monetary policy announcement, RBI governor Urjit Patel indicated that MCLR could be reviewed as the rate transmission to customers continued to be slow. While the banking regulator waffles on this, Citibank has come out with a home loan product that is linked to 3-month treasury bills (T-Bills). Is it allowed to do this? “RBI permits banks to link their variable rate home loans to MCLR, provide fixed-rate loans, semi-fixed-rate loans or (even) link their loans to an external benchmark,” said Rohit Ranjan, head of secured lending, Citibank India. This is not the first time a bank has linked its home loan product to an external benchmark. ING Vyasa Bank Ltd, in 2005, had a home loan product that was linked to Mumbai Inter-Bank Offer Rate (Mibor) (you can read more about it here). Let’s understand the home loan products linked to T-Bills and see if you should opt for them. Citi’s new home loan product is linked to the 3-month Government of India T-Bill benchmark. It is an external reference rate. Citi has decided to pick this data from the Financial Benchmarks India Pvt. Ltd (FBIL), which is a company that aims to develop and administer benchmarks relating to money market, government securities and foreign exchange in India. How is the data for this benchmark arrived at? According to FBIL, it is based on T-Bills traded in the market. The benchmark rate is announced everyday at 5.30pm, except on holidays. It is calculated from the data of secondary market trades executed and reported up to 5pm on the Negotiated Dealing System – Order Matching Platform (NDS-OM)—which is an electronic system for trading government securities in the secondary market. All trades of Rs5 crore or more, and having had a minimum of three trades in each tenure are considered. The benchmark T-Bill data is then published for seven different tenures: 14 days, 1 month, 2 months, 3 months, 6 months, 9 months and 12 months. So that there is consistency, the bank has decided to pick the rate published on 12th day of each month. “Our endeavour is to provide as much stability as possible on rates to our customers. We believe a date towards the middle of the month best suits this objective,” said Ranjan. Usually, the RBI too comes out with its bi-monthly monetary policy in the first week of the month. As this home loan product will be linked to 3-month T-Bill data, its reset clause will also be set for 3 months. This means, every 3 months your home loan interest would change based on movements in the external benchmark rate. Is a 3-month T-Bill benchmark appropriate for 20-30 year loans? In a developed market such as the US, mortgages are linked to longer duration benchmark rates. “Linking long-term loans to longer-duration benchmark rates is more appropriate to the extend that it is based on duration. But at the same time in the US, for example, mortgages tend to be fixed. Then it makes sense to link to longer term loan. In case of Citi’s home loan product, the reset is more frequent and linking to a long-term rate may not be appropriate. It is just a strategy,” said R. Sivakumar, head, fixed income, Axis Mutual Fund. The home loan also comes with a spread. In this case, it is around 200 basis points, plus T-Bill. The 200 basis points can vary depending on your credit profile. “As of today, home loan rate linked to t-bills will be around 8.5%….If your credit profile is good, then the spread could be lower,” said Ranjan. Remember that the spread that you agree to while signing a loan agreement will not be changed till the end of loan tenure. The RBI has said many times that there is no transparency in the way floating interest rate on home loans is calculated, and that there is need for a benchmark rate that is market linked so that any change in policy rates can be passed on to the consumers. Usually, banks keep the rates high even in a falling interest rate regime and you don’t see an immediate impact or cut in policy rates. To understand if home loans linked to T-Bills will bring in transparency, we compared T-Bills with MCLR and base rate. If you look at both comparisons, the drop in interest rates linked to MCLR as well as base rate come with a lag. If the home loan rates are linked to T-Bills, the reflection on falling interest rate is likely to be immediate on your home loan. The movement in T-Bill yields is a result of two parameters—repo rate and liquidity. Hence, if it is a falling interest rate regime, the fall will reflect faster in your loan rates. Currently, when your home loan is linked to MCLR, the impact on your home loan rate is also a result of the banks’ cost of funds and other parameters associated with the bank that you take the loan from. The concept of linking home loans to an external benchmark rate (instead of an internal one) is a good idea, as it makes the process transparent. Typically, banks have some leeway in controlling their rates. An external rate should obviate such a possibility. However, is it possible for banks to manipulate the external benchmark too? “It is very difficult, since the cut off rate is decided by RBI. The central bank has the ability to manipulate it but a market participant can’t since it is a big and liquid market,” said Sivakumar. As of now, the interest rate on home loans that is linked to T-Bills and MCLR are similar, due to the spreads attached to each one of them. A Citi home loan linked to MCLR has a spread of 40 basis points while the one that is linked to the T-Bills would have a spread of 200 basis points. Experts say that interest rates linked to an external benchmark will bring transparency and hence will help you to benefit more from falling interest rates. “The rate will fall as well as rise faster. In T-Bills you will see a decrease before the MCLR decreases. There will be periods where the rates will lead or lag each other. But over the life cycle of the mortgage, say 20 to 30 years, the difference should not be huge, assuming the spread of 200 basis points,” said Sivakumar. Currently, there have been signals of a higher interest rate regime kicking in. Hence, you may not benefit from T-Bill rates immediately. “The experience with base rate and MCLR has been that the rates tend to fall much more slowly when policy rates are falling. The moment you have an external benchmark, and there is no bank controlling it, the loan will be far more transparent and you are better off having that— especially when rates are falling,” said Vishal Dhawan, a Mumbai-based financial planner. But what about the 200 basis point spread? “The spread is a function of what you end up believing is the cost of running a business. Ultimately, the bank will also be raising resources, which is not necessarily linked to 3-month T-Bill rate. It will be unfair to believe that the cost of fund for the bank is only the 3-month T-Bill rate and the spread is too much. The value will become far more evident when the rate cycle turns again and rates go down—right now it may not make a big difference,” added Dhawan. As a borrower, however, you now have an option to pick a home loan based on an external benchmark. If it doesn’t work for you, you always have the option to switch to an MCLR-linked home loan. New Delhi – Ahead of the RBI monetary policy this week, the country’s largest bank SBI has reduced benchmark lending rate by 0.15 percent to 9.10 percent, a move that will lower EMIs for borrowers. Base rate or the minimum lending rate of the bank has been reduced from 9.25 percent to 9.10 percent effective April 1. The bank has also reduced its base rate by 0.05 percent to 9.25 percent. Similarly, benchmark prime lending rate (BPLR) has also been reduced by similar percentage points to 13.85 percent from 14 percent. With the reduction, EMIs for the new as well as existing borrowers who have taken housing and car loans at base rate will come down by at least 0.15 percent. The new rate is effective from the date the bank merged five of its associates and Bharatiya Mahila Bank putting it on the list of top 50 large banks of the world. The total customer base of the bank has reached 37 crore with a branch network of around 24,000 and nearly 59,000 ATMs across the country. The merged entity has a deposit base of more than Rs 26 lakh crore and advances of Rs 18.50 lakh crore. It is to be noted that the SBI has made changes in signage and logo, with its iconic keyhole set against the background of inky blue. There have been minor changes in the design and colour of SBI’s new look from April 1. The background to the SBI signboard has been changed from white to inky blue while the SBI logo or the monogram is a few shades lighter than the existing blue. After the Reserve Bank of India cut repo rate by 25 basis points (bps), some banks such as Indian Bank and Canara Bank Ltd cut their marginal cost of funds based lending rate (MCLR) and their base rate. State Bank of India Ltd (SBI), the country’s largest lender, had cut its MCLR before the monetary policy announcement. MCLR is the new benchmark lending rate at which banks lend to new borrowers. The existing borrowers are still on base rate and have the option to switch to MCLR. Currently, MCLR is 5-10 bps lower than base rate. One basis point is one-hundredth of a percentage point. When banks cut MCLR, they usually do it for all the five MCLR baskets. For instance, when ICICI Bank reduced its MCLR by 5 bps, its overnight MCLR and 1-month MCLR came down to 8.85% each, the 3-month MCLR to 8.95%, 6-month MCLR to 9.00% and 1-year MCLR to 9.05%. Out of the five MCLRs that banks publish on their websites, it is either the 6-month or the 1-year MCLR that is used as the benchmark rate for new home loan borrowers. For instance, SBI has benchmarked its home loan to 1-year MCLR, whereas Kotak Mahindra Bank Ltd has linked it to 6-month MCLR. Kotak Mahindra Bank’s 6-month MCLR is 9.20% and SBI’s 1-year MCLR is 9.05%. This also means there will be a reset clause in the loan document, which is linked to the tenure of the MCLR your home loan is linked to. In case of SBI it will be 1-year and for Kotak Mahindra Bank it will be 6 months. All MCLR-linked loans come with a spread, which is the margin that you have to pay above the MCLR. For instance, ICICI Bank offers 1-year MCLR at 9.05%. For a home loan of up to Rs5 crore, the spread is 25 bps, which means your home loan interest rate will be 9.30%. For home loans above Rs5 crore, the spread is 50 bps above the 1-year MCLR. Usually the spread is higher for larger loans. 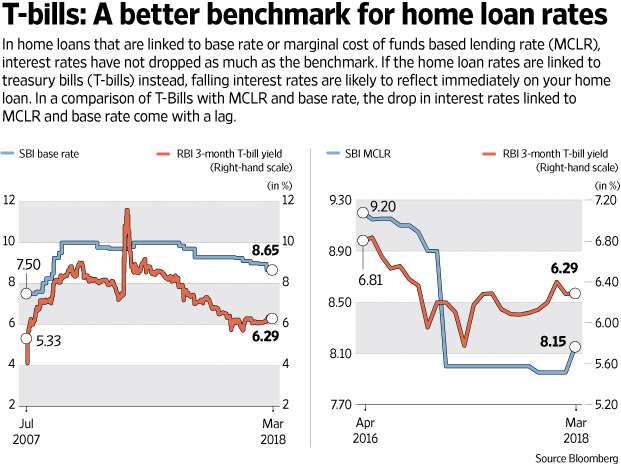 The marginal cost-based lending rate or MCLR that has kicked in from April 1 replaces the base rate system that was introduced with much fanfare six years ago. In theory, MCLR is fairly straightforward. The bank declares its MCLR every month, the benchmark rate, based on the latest interest rate it pays on deposits in that month, with a couple of additional items. Borrowers are charged a little above this rate as the bank will charge a ‘spread’. This will be pre-fixed at the time of giving the loan and cannot be changed easily. In theory, once the bank reduces its deposit rates, the MCLR will come down and since the ‘spread’ is pre-fixed, so will the interest rate for borrowers. But, there are issues. For one, unlike the base rate, there will be a multitude of rates such as overnight, monthly, quarterly, six-monthly and yearly. Banks are free to have more such rates. Each of these rates will be announced every month by each bank. Then, apart from the deposit rate, there are a whole host of subjective factors applicable in each calculation and there can well be a situation where these multiple rates move in opposite directions. That is, the monthly rate might be down but the annual rate goes up. Also, the applicability of the reset date has been left to the discretion of the banks. So, State Bank of India (SBI) and ICICI Bank have chosen to go for a yearly reset of interest rates for home loans, whereas Kotak Mahindra Bank has chosen a six-month reset and some other banks have chosen quarterly resets. The implications of this difference in reset periods will only be known in the future. In the current context, it implies that even if SBI drops MCLR in May, the home loan borrower will get the benefit only after one year. In addition, the MCLR system does not apply to housing finance companies such as Housing Development Finance Corporation and LIC Housing and other finance companies as well as non-banking finance companies. And, if you want to shift to the new mechanism, you may have to pay a fee. The good thing: Both floating and fixed rates are clearly defined – an excellent move. Three to seven year loans like car loans and personal loans, currently given on a floating rate basis by public sector banks (most private banks are already providing these on a fixed-rate basis), will shift to a fixed rate regime. This will help banks charge a prepayment penalty. It is also possible that banks may stop offering the floating rate option for such loans or make it more expensive. Even in the home loans segment, we shall see many hybrid loans where the initial period will be a fixed rate for at least three years, to enable the banks to charge a stiff prepayment penalty in the event that the consumer wants to prepay or shift his loan during this period. However, these types of loans have never been popular with the borrowers. Quite a few banks are going to keep the reset clause at 12 months from the date of disbursement. That will enable them to deny the benefit of the lower rate to the borrowers for at least a year. This is a double-edged weapon as in the future, this will also prevent banks from increasing the rates for a year despite an intermediate increase in interest rates. Maybe, at that time, they will change the reset period for new consumers. Of course, nothing but inertia prevents the consumer from shifting his loan without a prepayment penalty, even within the year.